No one was shocked by the outcome of John Tavares’ widely publicized foray into free agency. The lure of his hometown and prospect of joining a blossoming young core in Toronto were simply too tempting to pass up. For the longtime New York Islanders captain who had worked so tirelessly to will his team to the next level, this was a bittersweet decision. For the Islanders, it was just bitter. Their captain and franchise center had left for greener pastures. The general consensus was that the team was destined for a long and frustrating year. Then the 2018-19 campaign started. Through 14 games, they were sporting an 8-4-2 record that had many puzzled. Was Barry Trotz, fresh off a Stanley Cup victory with the Washington Capitals, now the best coach in hockey? 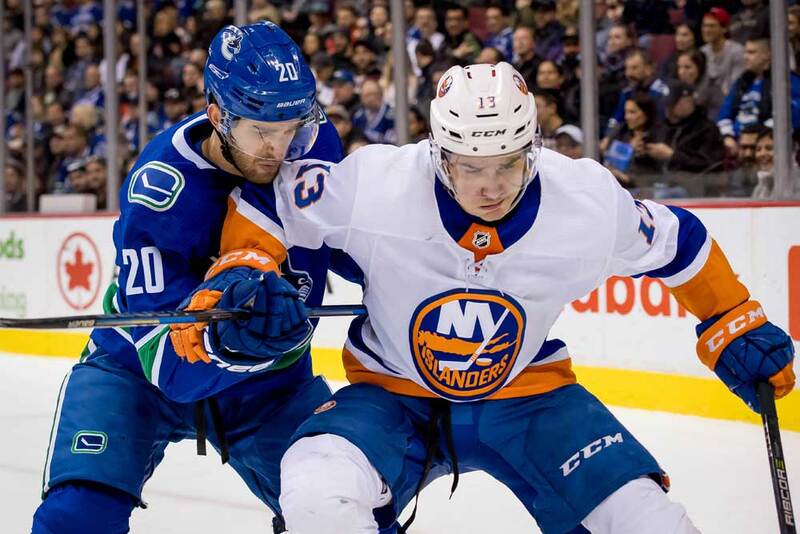 Was Mathew Barzal already better than Tavares? Did Long Island even miss its former leader? Even with their recent 4-5-1 slide, the Islanders sit just one point outside of a wild-card spot ahead of their Thursday night matchup against the Boston Bruins. However, this dip is a reflection of the team’s actual performance this year. Trotz has certainly had an impact on the club’s overall showings. The Isles play with more structure than they did under Doug Weight or Jack Capuano. There’s stronger puck support all over the ice and a greater sense of team chemistry. Unfortunately, his hiring won’t solve the central issue at play: On most nights, their personnel is downright overmatched. The box scores haven’t arrived to the same conclusion yet, but they will in due course. For starters, Natural Stat Trick indicates that Long Island boasts the highest shooting percentage in the entire league. Even if the team can manage to hold that rank, it is unlikely to maintain its rate of 10.5% — Tampa Bay led the NHL last season at 9.4%. This regression will be felt in the win-loss column. Converting at such a high clip has concealed the fact that the Islanders haven’t carried enough of the play this season. At 5-on-5, they control only 46.3% of shot attempts (28th) and 46.8% (27th) of scoring chances. They posted similar ranks in 2017-18 (28th in CF% and 29th in SCF%) and finished the season 17 points short of a playoff berth. Obviously, that is cause for concern. Roster-wise, Tavares’ absence cannot be overstated. Though a scoring-by-committee approach can mitigate that to some extent, it can’t replicate the level of respect opponents paid him. Barzal is now the subject of that focus, and while he’s still producing well (20 points in 23 games), he doesn’t look quite as dominant going up against top-tier competition every shift. At the quarter mark of the season, his CF% (52.3 to 49.5) and GF% (55.7 to 40.0) have dropped significantly from last season despite the club’s even-strength save percentage rising from 26th to seventh over that span. Facing the opposition’s best on a night-in, night-out basis is really, really difficult. The 21-year-old is a special talent, but he can’t do it on his own. Beyond his skill set, he made such a splash as a rookie (85 points in 82 games) because opponents were game-planning to stop Tavares. If they changed their matchup to neutralize Barzal, Tavares could then feast on lower competition. Few teams have the tools to counter a deadly 1-2 punch down the middle. That’s precisely why center depth is so coveted and why the Maple Leafs look so scary right now. With all due respect to Brock Nelson and Valtteri Filppula, who are both solid players, no one is scheming to curb their production. The opposition will afford them more space if it means Barzal has less of it. Teams aren’t shaking in their boots at the sight of Josh Bailey, Jordan Eberle and Anders Lee either. Barzal is without question the engine of the forward corps, and they recognize that. Tavares is also missed on the power play. He’s never been a true quarterback in that situation, but his vision and finishing ability are rare assets. Without him, the Isles have plummeted from sixth to 24th on the man advantage. Along with such a significant change up front, stagnancy on the back end is also hurting the team. Long Island’s assortment of blueliners simply isn’t up to snuff. There is no legitimate No. 1 defender, puck-mover or shutdown artist on the roster. When opponents start pouring it on, there isn’t anyone there to stem the tide. Nick Leddy and Ryan Pulock have been eating up minutes (roughly 22 per game) as the top pair, but they can only ride abnormally high on-ice shooting percentages for so long. They are getting absolutely pounded in shot attempts and scoring chances. 34-year-old Johnny Boychuk has fared slightly better in a reduced role alongside Adam Pelech. Both have limitations with the puck on their stick, though. Thomas Hickey, who usually takes shifts with 6’5”, 223-pounder Scott Mayfield, has been a bright spot on defense. Drafted fourth overall by the Los Angeles Kings in 2007, he took a few years to find his form, but he’s developed into a steady second-pairing defenseman. When the 29-year-old is on the ice, the Isles nearly break even in shot attempts and actually control more of the scoring chances. Alas, a nice second pairing is hardly worth writing home about. The Isles need difference-makers who can tilt the ice in their favor. Last year’s Vegas Golden Knights were the exception to the rule: A club of overlooked players captured lightning in a bottle, and as we know, the sum became astronomically larger than its parts. This year’s Isles don’t carry that chip on their shoulder. They don’t play with a ferocious desire to prove naysayers wrong. Their aging defensive forwards (Filppula, Leo Komarov) have been put through the wringer, conceding about 60% of the shot attempts and scoring chances during their shifts. Meanwhile, Barzal is struggling to cope with increased attention and responsibility. On the blue line, they’re just trying to survive rather than dictating the flow of the game. While the Islanders have done well to defy expectations early on, their lackluster personnel will eventually catch up to them. It may have already started to.